Portage County Randolph Fair's Junior Fair Page | The Biggest Little Fair in Northeast Ohio!!! The Biggest Little Fair in Northeast Ohio!!! The document lists the exhibitors in alphabetical order, with all their buyer and their addresses grouped along with them. 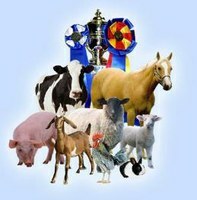 Every exhibitor selling their animal(s) at the Junior Fair livestock sales MUST write a “Thank you” note to the buyer(s). Every auction participant must submit a thank you note before they receive their auction check (the Sale Committee sends the checks to exhibitors as soon as payments for purchases exceed the total of checks to be written and the Thank You notes/letters have been properly submitted). The Thank You Notes/Letters must be submitted to the fair office NOT THE EXTENSION OFFICE. This “Thank you” note is to be delivered to the Fair Office IN A STAMPED, SEALED AND COMPLETELY ADDRESSED ENVELOP WITH JR. FAIR EXHIBITORS NAME WRITTEN IN THE RETURN ADDRESS! The note itself must be brought in to the Fair Office to be checked off before mailing. This “Thank you” note is to be delivered to the Fair Office IN A STAMPED, SEALED AND COMPLETELY ADDRESSED ENVELOPE WITH JR. FAIR EXHIBITORS NAME WRITTEN IN THE RETURN ADDRESS! The note itself must be brought in to the Fair Office to be checked off before mailing.